It may be small but it sounds huge and the Plug-Out architecture makes it a great investment. Killer! Compact, well-built and portable with plenty of modulation options. The built-in synth and the free Plug-Out SH-101 synth sound superb. Backlit interface with 'knob per function' ethos and no menu diving. Mains power only. No velocity or aftertouch. 32-note keyboard would be better. "It certainly turns heads when glowing in its full glory and also ensures that you know which parameter you're tweaking in the dark"
Although the name is inspired by the original System-100M modular synth, the System-1 is certainly not stuck in the past! 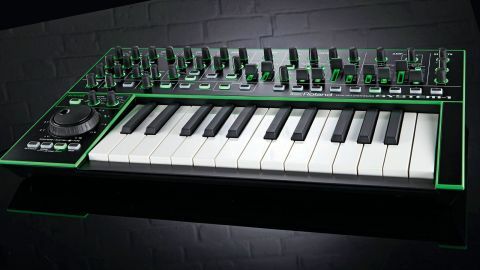 There's no mistaking that the System-1 is an Aira-line product with its familiar tough black plastic case, brushed metal faceplate, green trim and green backlit buttons/sliders - it certainly turns heads when powered up and glowing in its full glory and not only will the backlighting look great on stage, it also ensures that you know which parameter you're tweaking in the dark! Build quality is solid for the money in line with the rest of the Aira products and the System-1 is also compact and stupidly light, which is great for folks with smaller studio spaces and for those that want to gig but don't want to cart around heavy keyboards. It's also great for on the move music making, though you'll need a power socket on hand as unfortunately it doesn't take batteries. The two most striking features on the front panel are the unique shallow travel keyboard and the combined Scatter/ Pitch Bend wheel. The keyboard is two octaves long (no doubt to keep the unit compact) and it features unusual low-profile, flat-edged keys. It's fair to say this keyboard will divide opinion - some will like it as it's very fast to play but perhaps some players will miss the extra controllability that deeper key travel provides. We think it's great for the purpose intended (playing basslines, leads and four-note chords) and this writer prefers shallow keybeds for synth duties, particularly as they do facilitate faster playing. However, there are some other small downsides - firstly you'll have to adapt your playing technique slightly from other normal profile keyboards; secondly there's no velocity or aftertouch (but you can use the LFO with a medium 'fade in' set to pitch mod for a pseudo aftertouch/vibrato effect); and thirdly, a 32-note keyboard would have been more appropriate here, particularly as the SH-101 Plug-Out synth (and the original SH-101) both feature 32-note keyboards. Even better, we would love to have seen a four or five-octave keybed, though maybe we are going to see a whole line of 'System' badged products with different sized keybeds in the future, so let's wait and see! To save panel space, the Scatter wheel also has an outer ring that can bend pitch +/- two semitones, whilst there's a Mod button in place of a normal mod wheel. In practice, this set-up works well and it's a good compromise but the pitch bend range is currently fixed and it's not quite as quick, accurate or as comfortable to use as a dedicated pitch/mod stick or separate wheels. Regardless, the front panel is elegantly laid out with a knob-per- function ethos (36 knobs and ten envelope sliders) and I really dig that there's no screen, which means no menu diving. Also, with so many live performance controls at your disposal, the System-1 is a whole load of fun to tweak and it's both addictive and inspiring to work with in general. "The System-1 is a great starter synth with its simple layout, yet it's still deep enough feature-wise to please more serious synth heads"
Newbies will find the System-1 a great starter synth with its simple layout, yet it's still deep enough feature-wise to please more serious synth heads. For those wanting to get their hands dirty, simply hit the Manual button and enjoy building sounds from scratch, or if you're more of a preset head, then start with one of the eight factory presets (which incidentally are pretty weak and don't show you what this thing can really do!) and tweak from there. Whilst on this subject, eight user-writeable presets in this day and age seems very stingy, though all the Aira range products are fairly limited in terms of preset/user storage (also note that the new TR-8 1.1. firmware update now allows pattern/kit backup/restore over USB). Still, it's eight more presets than the real SH-101 has and any installed Plug-Out synth also has eight presets directly accessible from the front panel. Like the TR-8, you can also back up and restore sounds over USB but we'd like to see an OS update where you can hold the Manual button to go into 'bank select' mode and then use the Scatter wheel to select from ten user banks. Importantly, the System-1's native ACB engine has been well thought out and the four-note polyphonic, dual oscillator+sub oscillator (monotimbral) synth engine sounds surprisingly heavy and analogue-like when programmed to do so (though excels at bright/clean sounds too). There are the usual mono, legato and unison modes (and polyphonic portamento), though there's currently no way to select high/low note priority in mono mode. ACB technology (as in the TR-8 and TB-3) models the analogue signal path down to component level and, though the System-1 features familiar saw, square and triangle waves/models, it also has the Roland Super Saw, plus new Super Square and Super Triangle waves - these are stacked/detuned waves for bigger sounding patches. Generally, the System-1's character is dry, precise and upfront and it excels at synth brass patches and cutting leads using the 12dB filter, whilst the 24dB mode is a tad smoother and great for powerful bass, poly and lead sounds. The resonance and cutoff are smooth and aliasing free and the low extension is extremely deep (one of the ballsiest low-ends around!) yet at the same time it can be tamed using the high-pass filter and tone control. The onboard envelopes for Pitch (AD), Filter (ADSR) and Amp (ADSR) are snappy too and you can easily get that satisfying Moogy click to the beginning of sounds which is great for making basses, percussive FX and drum sounds. In addition, there's a fast LFO with key trigger and sine, triangle, saw, S+H and random waves, which can be sent in varying amounts to pitch, filter and amp individually or simultaneously, plus there's a ring modulator, oscillator sync, cross modulation of Osc 1 frequency by Osc 2's waveform and white/pink noise. Each oscillator also has a 'colour' control, which introduces time-based modulation via the LFO, envelopes, the sub oscillator, or manually. All in all, it's surprisingly well featured. To sum up, the System-1 offers a lot for the money. The ACB engine can produce lush strings, mellow pads and massive mono/unison leads and basses, yet it can easily make great effect sounds and analogue style drums using the noise generator, filter resonance and effects. It's also got decent mod facilities and a nicely hands-on interface (all controls also send Midi CCs) plus there's a two in/ two out USB audio interface too. We would have preferred a normal profile three-octave keyboard with velocity/ aftertouch and normal pitch/mod wheels but as a complete package for under £500, it works very well and with the possibility of more Plug-Out synths in the future, the System-1 seems like a great investment going forwards. No doubt it will appeal to anyone wanting a lot of power/versatility and punchy sonics for a minimal outlay. A great little synth indeed!